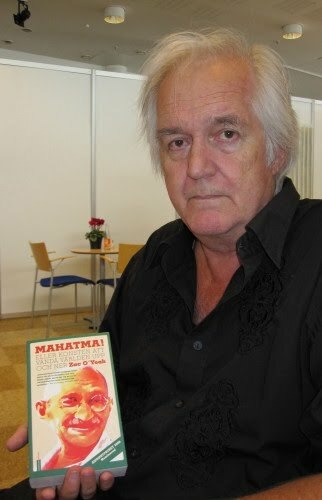 Interview with Henning Mankell, "Crime fiction is the mirror"
Mankell, Mankell is the name that comes up all the time, so I booked an interview. Henning Mankell lives just part of the year in Sweden; for him home is Mozambique where he heads the African Teatro Avenida. Essentially a theatre man, he knows the rules of dramatic writing. And if that isn’t enough his wife Eva Bergman, daughter of the late film director Ingmar Bergman, is also a theatre director. He picked the name Wallander randomly from a telephone directory and published Faceless Killers in 1991 as a comment on growing racism in Sweden. During the decade that followed he wrote a new ‘Wallander’ novel each year, exposing the rotting bone structure of the dying welfare state. And with that he spearheaded an unexpected boom in Swedish crime fiction. To date, his ‘Wallander’ series has sold twenty-five million copies and spawned thirty movies, including the BAFTA-winning BBC-versions starring Kenneth Branagh (incidentally, Branagh is a confessed Wallander-fan). But for years, after the ninth and supposedly last book The Pyramid (1999), he had put Wallander out of his mind and focussed on other things, such as theatre, until he suddenly felt that there’s one more story left to tell. He’d never written a book about Wallander as a person. Mankell, now 61 years old, noticed how poorly old people are regarded in Sweden, where it is uncool to be old – unlike in Mozambique where older people are respected for their experience. So it was time to revisit the scene of the crime. The tenth book, The Troubled Man, was launched in August and by September the first edition of 125,000 copies had sold out – proving that Mankell is still the King (though English-readers may have to wait for the translated version). Sitting face to face with him at the Swedish Book Fair, my head is spinning with questions about craftsmanship, his unusual life – his first job was as a sailor on a ship to South America – and his quitting the genre. So when will you come to India? Your ‘Wallander’ novels too seem to chronicle important changes in society? Your choice of setting the books in Ystad appears to have created a trend. What do you think will happen with crime fiction in the future? Is there anything that Indian crime writers could learn from this? Did you know that your fictional cop, Kurt Wallander, has fans in India? He walks off, dashing in a loose-fitting black suit, white hair on end. People turn discreetly to stare at a face that is more familiar than, well, his father-in-law’s.